Bittersweet Monthly has been nominated for Best Magazine website in the 21st Annual Webby Awards. Hailed as the “Internet’s highest honor” by The New York Times, The Webby Awards, presented by the International Academy of Digital Arts and Sciences (IADAS), is the leading international awards organization honoring excellence on the Internet. IADAS, which nominates and selects The Webby Award Winners, is comprised of Internet industry experts, including Executive Creative Director at Refinery29 Piera Gelardi, Musicians Questlove & Grimes, Head of Fashion Partnerships at Instagram Eva Chen, Twitter Co-Founder Biz Stone, Gimlet Media CEO Alex Blumberg, and Jimmy Kimmel. 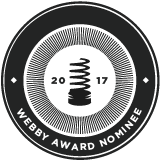 As a nominee, Bittersweet Monthly is also eligible to win a Webby People’s Voice Award, which is voted online by fans across the globe. From now until April 20th, Bittersweet Monthly fans can cast their votes at vote.webbyawards.com.